The Chalcolithic was a period of increasing social complexity as farming villages flourished. Agricultural production intensified, large-scale trade networks expanded, settlements became increasingly interdependent, and population density soared . Material culture, technology and social organisation became increasingly complex, leading to the first literate, urban centres by the end of the Chalcolithic. In West Asia, a large area that includes the eastern Mediterranean, Syria, Jordan, Israel and Iran, the Chalcolithic period occurred around 8,000 to 5,000 years ago [2, 3]. By 8,000 years ago, sedentary, agricultural villages had been fully established in West Asia. These communities grew rain-fed crops like barley, wheat and legumes, and farmed sheep, goats, cattle, and pigs . The development of irrigation agriculture was a major technological breakthrough – the construction of man-made canals which transported water from rivers to otherwise dry land, allowing the cultivation of crops across the broad plains of West Asia. Further innovative advances included the introduction of draft animals and the potter’s wheel [2, 4]. Metalwork also became more complex from 8,000 years ago onwards. Although there is some evidence of metalwork prior to the Chalcolithic – such as copper beads found at Çayönü, Anatolia, dating to 10,000 years ago – the use of copper was not common . This changed during the Chalcolithic, as larger copper objects such as maceheads became more widespread . In the early Chalcolithic, West Asia can be generally split into the Halaf and Ubaid cultures . 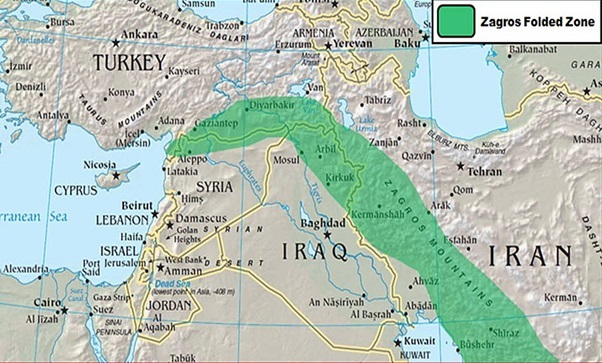 The Halaf culture ranged from northwest Iran across northern Iraq and Syria into southern Anatolia, whilst the Ubaid culture occurred in southeast Iraq and Iran . Halaf settlements were generally small, occupied by no more than 150 people, and characterised by distinctive circular architecture . Our understanding of Halaf symbolic practices is limited – there is little evidence for standardised ritual buildings or burial practices. However, Halaf communities did share a package of cultural traits which included painted pottery, obsidian objects and clay figurines [7, 8]. 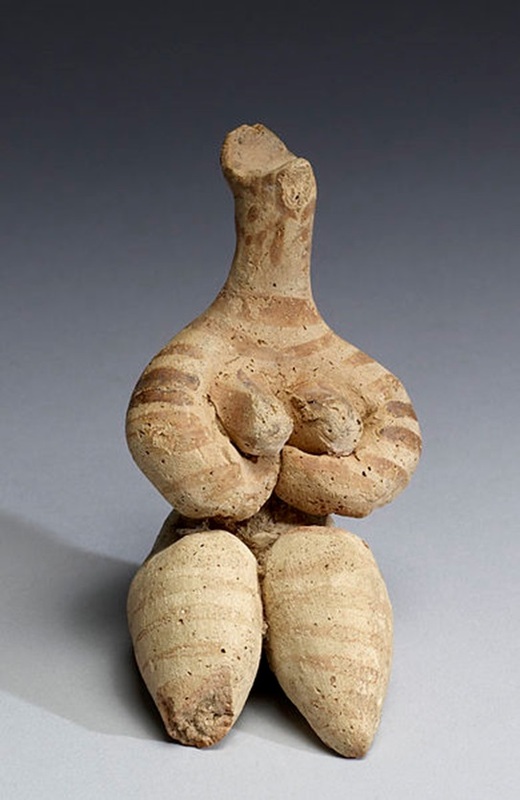 These figurines were typically female, often with exaggerated sexual features [2, 9]. Stone stamp seals, and pieces of clay impressed by these seals (known as sealings), also emerged during this period – these were used to secure containers like pots and baskets, and are the earliest evidence of material possessiveness. Some sites, such as Chagar Bazar in Syria and Tilkitepe in Turkey, appear to have acted as centres for the trade of pottery and obsidian, suggesting the presence of large trade networks [2, 8, 10]. Ubaid sites were characterised by large, mud-brick buildings and ritual centres believed to be temples . At Eridu, in southern Iraq, a sequence of temples of increasing size and elaboration were built on top of each other over a period of several centuries . Faunal remains suggest large quantities of fish were burnt here, perhaps as an offering of some kind . Evidence of stamp seals and clay sealings have also been found at Ubaid sites. At Tepe Gawra, Iraq, over 700 seals and sealings were discovered in a temple complex, suggesting the temple may have played a role in collecting or distributing commodities . The Ubaid people created standardised geometrically-painted pottery, which has been found as far as Qatar and Oman, indicating the existence of long-distance trade networks . By around 6,400 years ago, the Ubaid culture had spread northwards, stretching into southeast Anatolia and replacing the Halaf culture . During the late Chalcolithic (6,000 – 5,000 years ago), large-scale settlements began to grow on the fertile plains of Lower Mesopotamia (the region between the Tigris and Euphrates rivers, in modern-day Iraq). By around 5,200 years ago, these communities could be considered fully “urban”, with monumental temples, administrative buildings, public spaces, specialised craft production zones, and areas of housing . One such settlement was Uruk, argued to be the first city in the world . 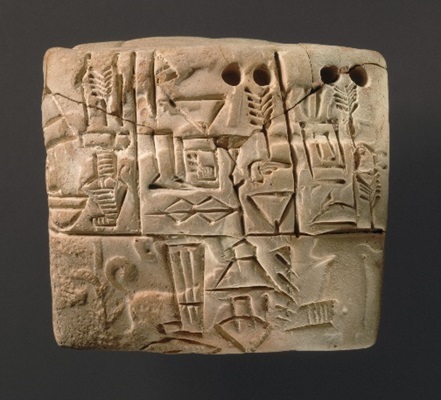 It is here that the earliest evidence of writing has been discovered: clay tablets, dating to 5,500-5,000 years ago, inscribed with a script known as cuneiform, which appear to relate to temple administration . Uruk emerged due to the development of agricultural and administrative technologies which allowed people to fully utilise their environment and produce surplus goods. This surplus wealth was largely controlled by the religious authorities, who collected it and then redistributed it to temple-workers in the form of rations . Uruk-style culture spread throughout Mesopotamia up to Syria, likely due to the trade of raw materials such as timber and semi-precious stones [1, 17]. By the beginning of the Bronze Age around 5,000 years ago, Lower Mesopotamia hosted a large number of independent city-states such as Ur, Lagash and Umma . One Chalcolithic site is Seh Gabi, located in the Zagros Mountains in western Iran, near to the modern-day city of Kermanshah. The Zagros Mountains range 1,500 km across western Iran, stretching into northern Iraq and Turkey. This region was an ideal place for farming to emerge and later flourish: it had sufficient rainfall to support crops, and was the home of the wild ancestors of sheep, goats and cattle. Seh Gabi has an area of fifteen hectares, and was likely occupied between 6,500 and 5,500 years ago . It is just six kilometres from the much larger Chalcolithic and Bronze Age site of Godin Tepe, which is thought to have acted as a centre for the trade of metals or semi-precious stones. 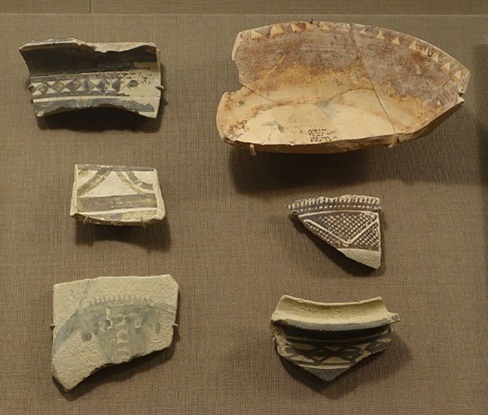 During the Chalcolithic, the regionalisation of ceramics was common in the Zagros region . A large amount of distinctive painted pottery has been found at Seh Gabi; this was usually a green or tan colour, with geometric or animal motifs painted in black on the upper, exterior third. A common design was that of stylised goats. This type of pottery was produced here and then imported elsewhere in the Zagros Mountains . Further evidence suggests stone beads, textiles, metal objects and clay figurines may also have been produced at Seh Gabi . Seals and sealings found at this site, along with its proximity to Godin Tepe, suggest Seh Gabi was part of a complex and interconnected trade network . Thirty-one individuals have been discovered at Seh Gabi, the vast majority of which are infants and children . Several pre-adolescents show evidence of intentional cranial modification during infancy, resulting in elongated head shapes in adulthood . This practice has been found to occur at Neolithic sites in the Zagros area, including Tepe Abdul Hosein and Tepe Ghenil . Six infants from Seh Gabi have been genetically sequenced; they range in age from newborn to nine months old . The Chalcolithic populations of the Zagros Mountains were related to the Neolithic populations that came before them . However, some genetic admixture did occur – Chalcolithic Iranians had a mixed ancestry, having DNA from both Neolithic Iranians and outside populations. These outside ancestral populations may have been Neolithic farmers from the Levant or hunter-gatherers from the Caucasus. The inhabitants of Seh Gabi also derived around a third of their ancestry from ‘Basal Eurasians.’ The Basal Eurasians are a lineage which split off prior to the differentiation of all other European lineages, and prior to the interbreeding between Neanderthals and modern humans that occurred around 50,000 – 65,000 years ago . The Chalcolithic people of the Zagros Mountains likely intermixed with various populations – Chalcolithic Iranians contributed up to 44% of the ancestry of Bronze Age groups in the Levant, and up to 33% of the ancestry of Late Chalcolithic people from Northwest Anatolia. Genetic admixture also occurred in Europe – populations related to Chalcolithic Iranians contributed about 43% of the ancestry of early Bronze Age people of the Eurasian steppe . The individuals from Seh Gabi carried a range of mitochondrial haplogroups including U, H, K and I. Both H and K are known to have Middle Eastern origins, whilst U was common amongst European hunter-gatherers during the Palaeolithic period [26, 27, 28]. 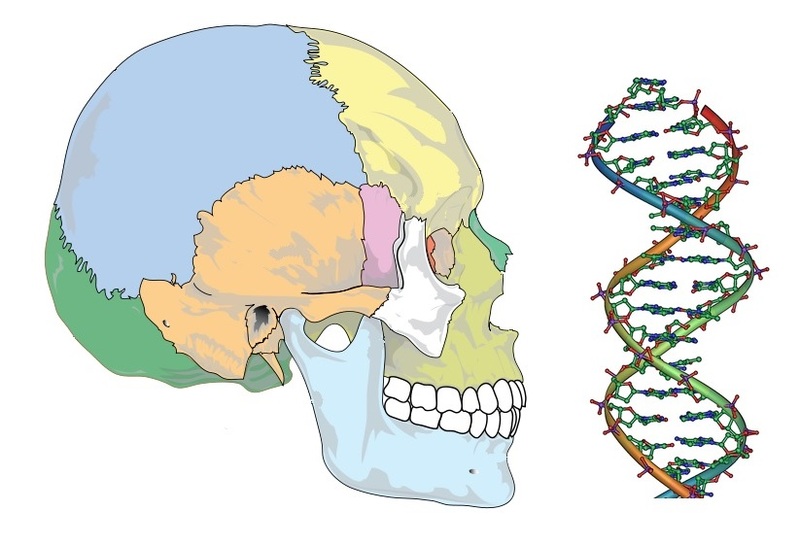 Two male individuals carried Y-chromosome haplogroups J and G. Both haplogroups are common in Europe today and are thought to be of Anatolian or Iranian origin, brought to Europe by Neolithic farmers [29, 30]. Safar, F., S. Lloyd, and M.A. Mustafa. 1981. Eridu. Baghdad: Iraq Government Press. Moghaddam, A. and Javanmardzadeh, A. 2013. The Chalcolithic in the Central Zagros. In Potts, D.T. (ed.) The Oxford Handbook of Ancient Iran. Secher, B., Fregel, R., Larruga, J.M. et al. 2014. The history of the North African mitochondrial DNA haplogroup U6 gene flow into the African, Eurasian and American continents. Evolutionary Biology 14: 109. Semino O, Magri C, Benuzzi G, et al. 2004. Origin, Diffusion, and Differentiation of Y-Chromosome Haplogroups E and J: Inferences on the Neolithization of Europe and Later Migratory Events in the Mediterranean Area. The American Journal of Human Genetics 74: 1023-1034.